Kathys Cluttered Mind: Why You Should Invest In Memberships? Why You Should Invest In Memberships? As you may know I admin a large homeschool group for the Southeast United States, called SE Homeschool Fieldtrips. There are over 2,000 families now in the group and well it keeps me VERY busy which is why you don't see me blogging as much as I used to :) You see we have embraced a different way of educating our children. Rather than sitting at the kitchen table reading about animals, nature, wars, knights, etc in a textbook we go out and experience them. Don't get me wrong books are awesome and we love and use them a lot too (especially in the car while we are driving to our destination for the day), but we also take full advantage of the world around us. I have found that the experiences are more memorable and unforgettable. And that is one of the many reasons I created the SE Homeschool Fieldtrips Group. It is a place for me to share with other families the amazing, educational opportunities we have available to us. It is a place for me to share tips and tricks for fieldtripping and traveling with children. And it is a place for me to share my passion for experiential learning. In Georgia and our neighboring states there are endless educational opportunities for families. I often hear families say that they don't take advantage of these opportunities because of the expense involved with visiting some of them. And that is why today I am going to share some information about memberships and the reasons you should invest in them, how to save money on them and even how to get one for FREE in 2015. 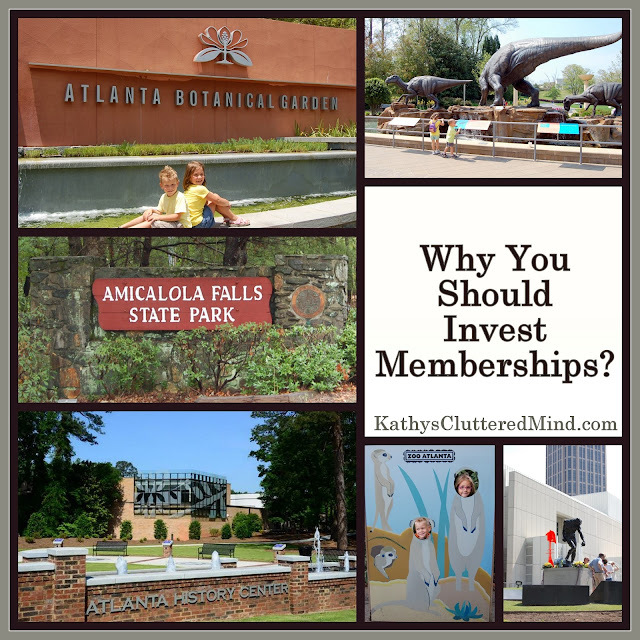 Just about every museum, zoo, aquarium, history center, nature center, state park, amusement park, etc offers a membership of some sort. Since we cannot obviously purchase a membership to all of them every year we rotate our memberships. We generally have 3-4 memberships at a time. Some of our local favorites have been the HIGH Museum of Art, Georgia State Parks Pass, Fernbank, Atlanta History Center, Legoland Discovery Center, Zoo Atlanta, Elachee Nature Center and Chattahoochee Nature Center. Special Perks - who doesn't love some special perks? With a membership you can almost always guarantee that you will receive discounts in the cafe and gift store. But you can also sometimes get additional benefits like early registration to special events or discounts on special events. Friend Benefits - sometimes things are way more fun with friends! Most memberships provide you with several guest passes that you can share with friends or extended family members. Some even allow you to bring friends for FREE (like Legoland Discovery Center on Friend Fridays, Atlanta Zoo). And others provide your friends with a generous discount every time you bring them (like the HIGH Museum of Art). Reciprocity - if you travel often than this is a great reason to get a membership, because you can take advantage of reciprocity benefits (FREE or discounted admission) at participating attractions around the country, thanks to programs like the AZA, ASTC, NARM, ACM and others. Discounted or More Accessible Parking - there are quite a few museums where the only parking available is paid parking. But if you have a membership you can receive discounted, FREE or more accessible parking. Tax Deductible - many memberships are tax deductible possibly saving you even more money come tax time. Homeschool Days - many attractions offer homeschool day programs and if you are a member they are often discounted or even included in the cost of your membership. Support - by purchasing a membership your money is supporting a cause/effort ie: art restoration, animal conservation, etc. Make Great Gifts - if you need to purchase a gift for a family and have no idea what to get consider an attraction membership. It is a gift that keeps giving and a great way for families to create special memories together. Endless Learning Experiences and Memories - museums, zoos, state parks, etc are not only fun, but they are also great learning experiences for both kids and adults. And they are a great way to create special memories with your family. Changing Exhibits - exhibits, animals, and experiences come and go so you are always in store for something new at an attraction. Some obviously change more than others but by having a membership you can experience those changes and maybe even have some input into them. Freedom - have you ever been to a museum that is so large that you are overwhelmed and worried you won't be able to see it all? Or maybe you visited a museum with young children...and ended up having to leave earlier than you wanted? Well having a membership gives you the freedom to enjoy the attraction without feeling rushed, stressed and overwhelmed. "I love the freedom it gives us to explore places more deeply and fully, without feeling the need to see it all in one day. With a membership, we can spend 3 hours observing lions and not feel like we are missing out on anything else. We'll hit the other stuff a different day." - Betsy S.
"With a family of 5 to buy one visit is just slightly less or sometimes more than buying an annual pass / membership. So we usually get the membership. It is also nice when a membership has extra perks like a discount at the cafe or gift shop. I like memberships that include grandparents or extra kids. RECIPROCAL memberships are the BEST I love when being a member to one place gets us in for free or a discounted rate at another place." - Elizabeth M.
"I also like memberships for the discounts it gives us on things like classes, gift shops, parking, etc. We really like being able to take out of town friends and family places. Either our membership gets them a discounted ticket, or we can take them in with our family pass." - Christina G.
"A membership / and the membership card in my wallet is a gentle reminder to get out and enjoy life" - Alana G.
Educator Discount - if you are a homeschooler or teacher ask about receiving the educator discount. Many of the Georgia attractions offer about $10 off memberships if you show them proof that you homeschool or teach in the public school system. Split The Cost - many family memberships get in up to 4 kids and 2 adults. So if your spouse doesn't go often with you split the cost of a membership with a friend instead. Deal Websites - take advantage of deal websites like Groupon, Sweet Jack, etc. Often attractions offer membership deals on these websites sometimes saving you up to 50% off. 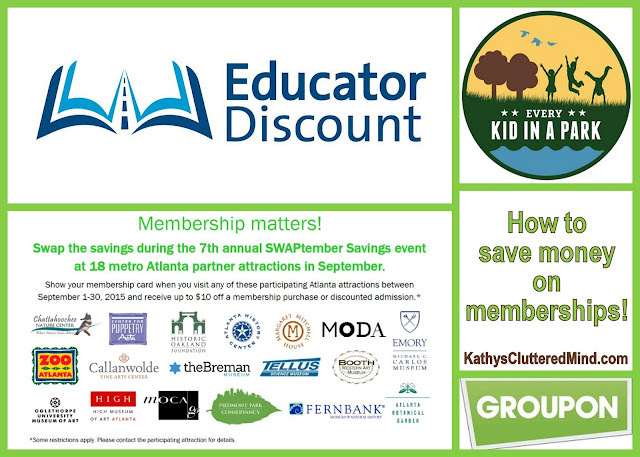 Swaptember Savings - take advantage of Swaptember Savings which happens every September in Georgia. During the entire month you can show your membership from a participating attraction and save up to $10 off a membership or discounted admission at another participating attraction. 4th Grader FREE National Park Pass - in 2015 every 4th grader can receive a FREE National Park pass thanks to the Every Kid In A Park initiative. The park pass will benefit the entire family of the 4th grader for 1 year. And there you have it! So which memberships will you be investing in this year?